This home in Washington County is so special. The homeowners and I (and their architect and builder and many wonderful craftsmen) have been working for some time to see this beauty finally emerge and boy is it emerging to be everything we hoped! Every site visit I am so excited to see it come to life and near completion! Is there anything better than the smell of sawdust and fresh paint and the sound of saws and hammers! Not to me! These colors are soft but fresh and feel so organic and fitting to their landscape, especially with the wildflowers still blooming just outside! 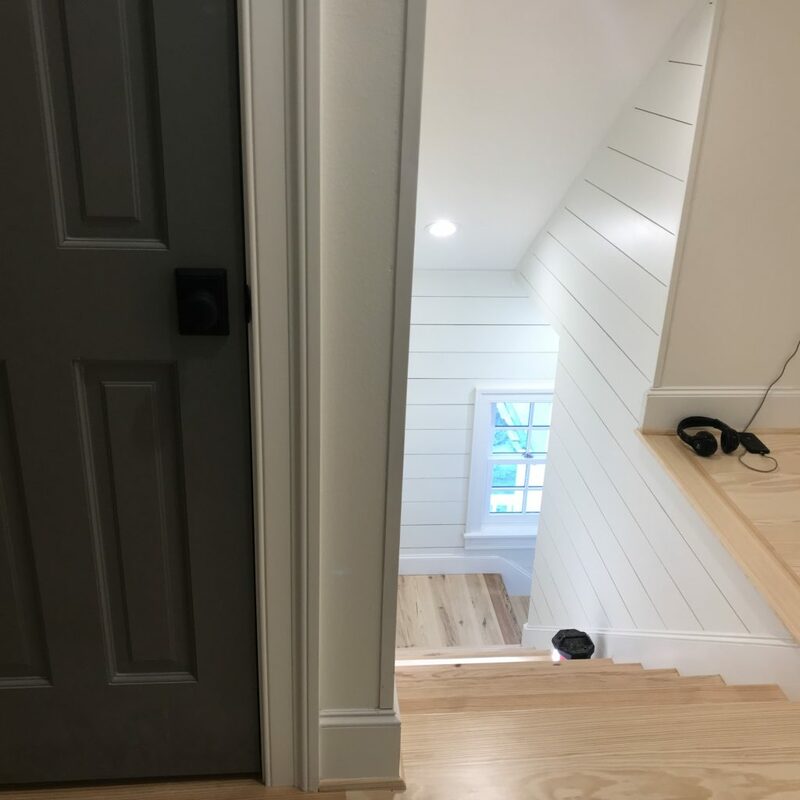 Most of the house is painted BM Pale Oak, SW Eider White with dark accents of SW Dorian Gray and SW Classic French Gray. And SW Peppercorn in one very special room! We may be discussing a drinking game with the aim of naming these colors! 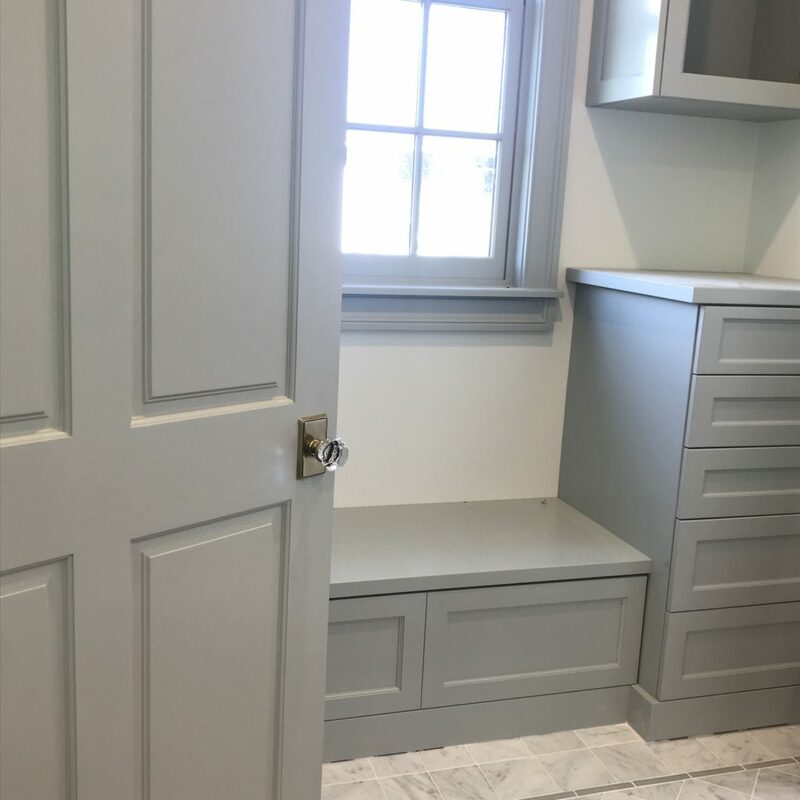 The top color is custom just for the lady of the house! I like to think Mr A. Hayes Town himself would approve of this color palette, I am so pleased with how they play of one another and the natural light. 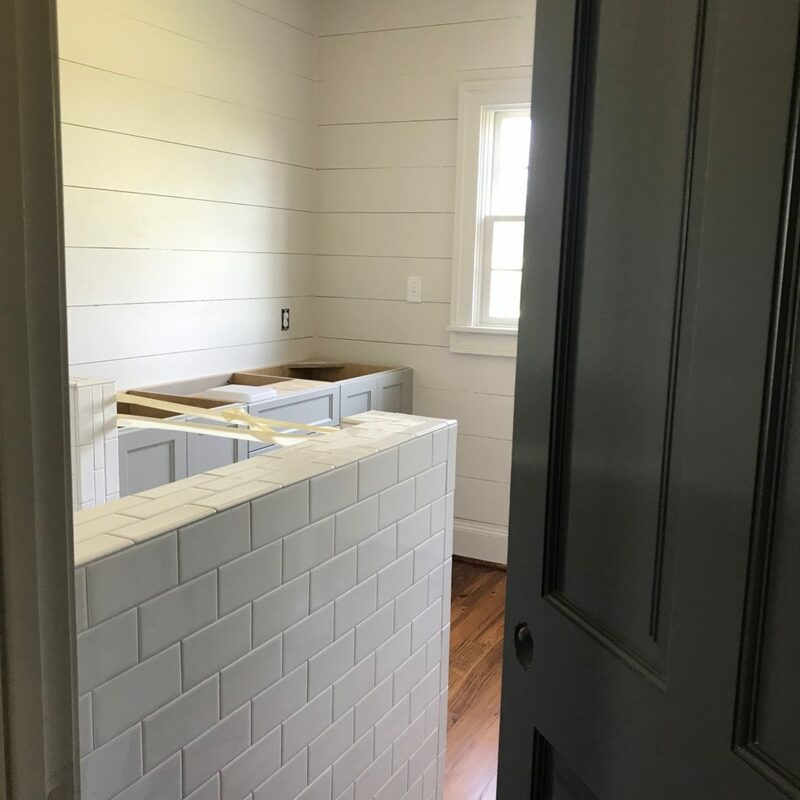 Not all my doing, the homeowners did a lot of samples and comparing colors, total team effort to get to this point. Houses like this don’t just happen! 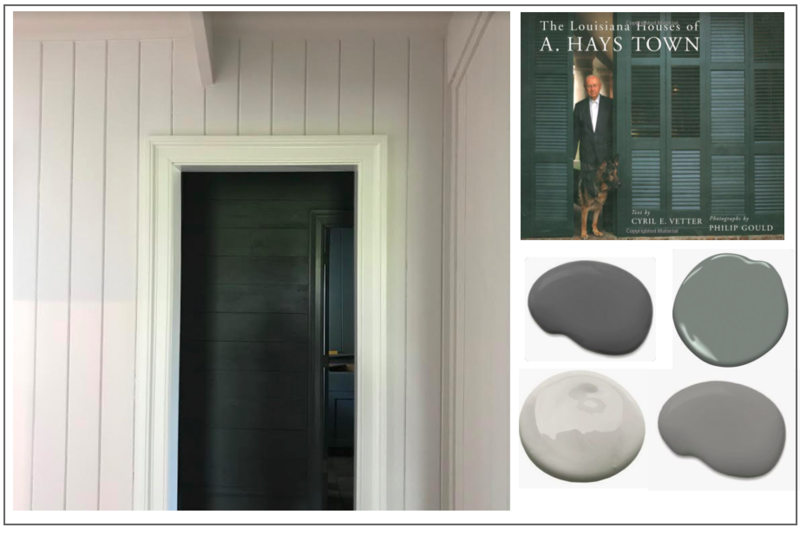 I couldn’t help but think of this famous image of him today when I saw this Duxbury and Classic French Gray paint on the walls! More to come including some wonderful exterior photos and brick flooring and grasscloth. 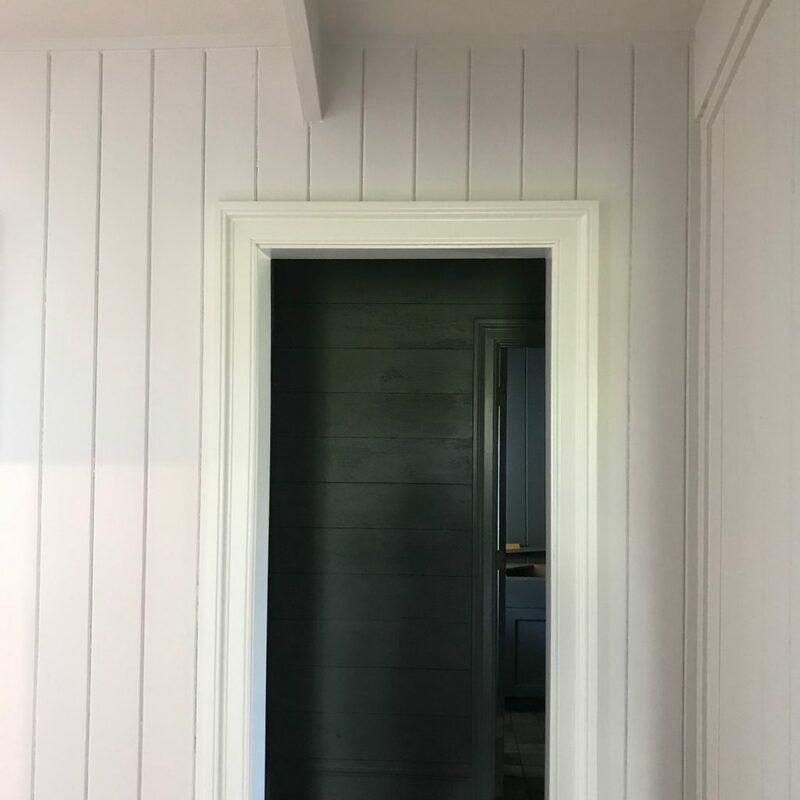 Also I am hoping the homeowners will let me share some of the tips and tricks they learned in researching some historic Natchez, Mississippi, paint colors! They did their homework. It’s been such a joy to be a part..amazing team of architectural design, builder, craftsmen and more. Including Fischer Tile of Brenham Texas and JM Floors. I can’t wait to see the lighting via True Blue Home installed and marble via BRENHAM AREA MARBLE in place. ‘Holiday at Home’ class photos + 2018 movies! So in early November this very special class finally happened and it was beyond what I even imagined. By working with Downtown Brenham and their wonderful people and historic facilities, the amazing talent of Mr. Keith Taylor and local legend and classic “go to” for furnishings and accessories, Hermann Furniture, we were able to create something truly special! Big thanks for Natalie Lacey Lange for capturing the day! 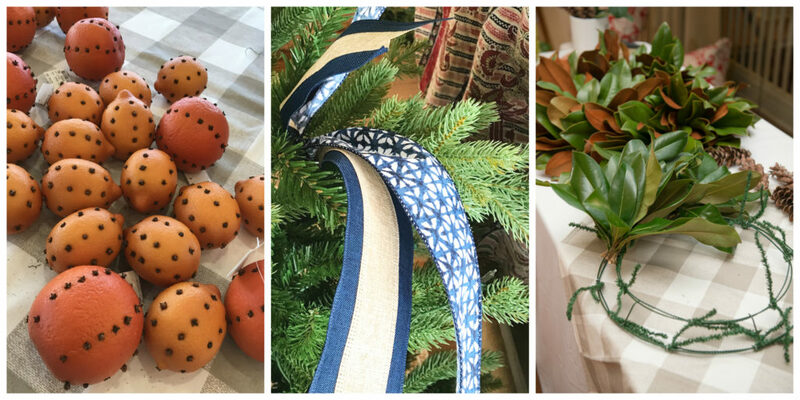 Prep began days and weeks before gathering ribbon and florals, real and artificial from near and far…literally! 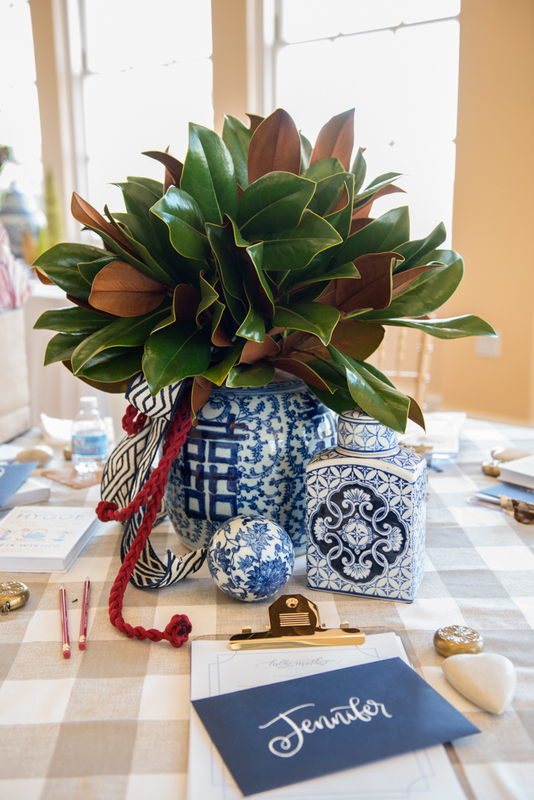 Faux fruit below on left, one of my fave things we used in the event is from Hermann’s Furniture just steps from where the class was held in Barnhill Center, ribbon from Michaels of all places, and fresh magnolia straight from Arkansas! 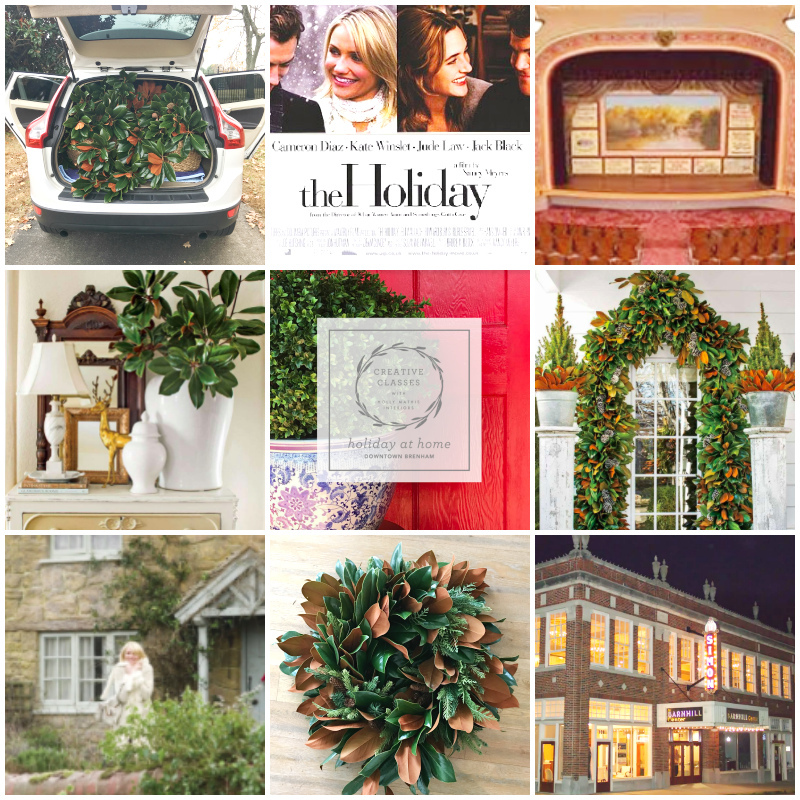 The goal of the event was to talk about and be inspired by the movie we watched the night before, Nancy Meyer’s The Holiday, and delve into the ideas of what makes the holidays truly special for our families and gatherings….and how to achieve that feel and beauty while maintaining sanity! Jude Law on the big screen, the English countryside covered in snow with its hygge coziness, and the beauty of the historic Simon Theatre on a Friday night, all prepped us for even more beauty and fun all day on Saturday! And I loved seeing our attendees visit and enjoy one another, we had people from New York, Louisiana, all over Texas and of course, Arkansas! I also knew the with the tough events of 2017 I wanted to focus on more than just “stuff” and ribbons but the heart of why we decorate at the Holidays..the meaning of it all and a new word we had fun pronouncing crazy ways…. HYGGE! 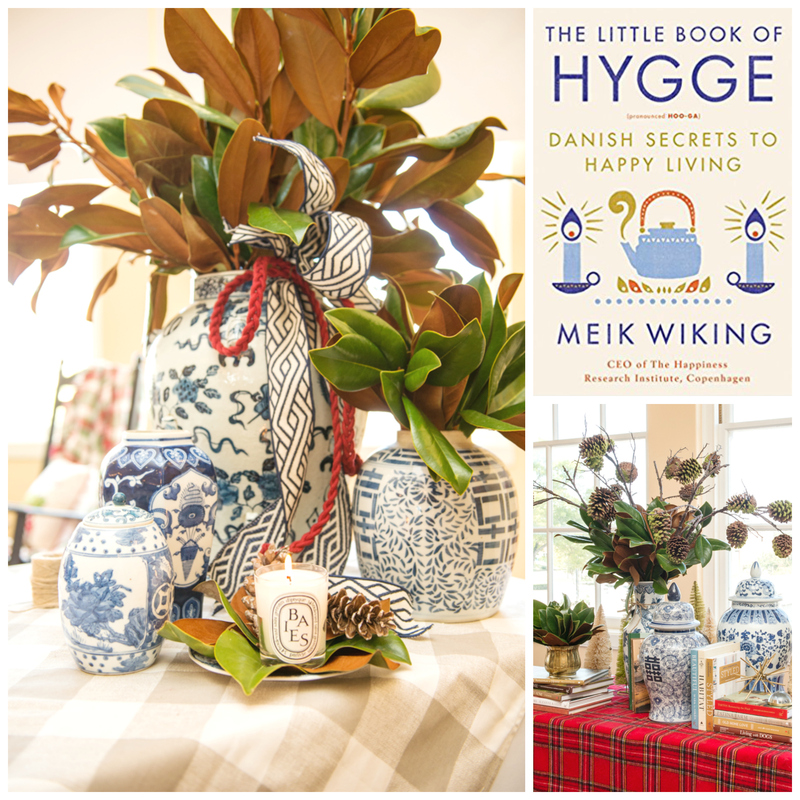 Everyone received a copy of the cute little Hygee book and we learned a bit about what the Danish have known for years regarding candles, comfy socks and blankets, warm drinks and soups and soaking up time with the ones you love! Some might say we Southerners just call it hospitality and maybe so but there seems to be another layer and depth to this word I wanted to incorporate and explore on this day before going into the holidays! 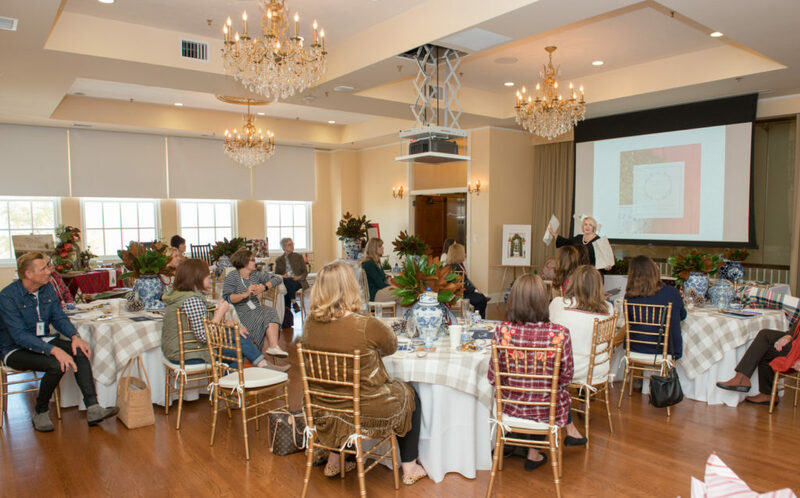 The class portion of the weekend was held in the ballroom above the Simon Theatre, which is all part of Brenham’s historic Barnhill Center. The vision, fundraising and hard work that went into restoring this large building is such a testimony of local love/community and preservation, all things I care about so deeply so it was an honor to coordinate and do an event in this space! It truly is a jewel in our little town and place of many weddings and special events. 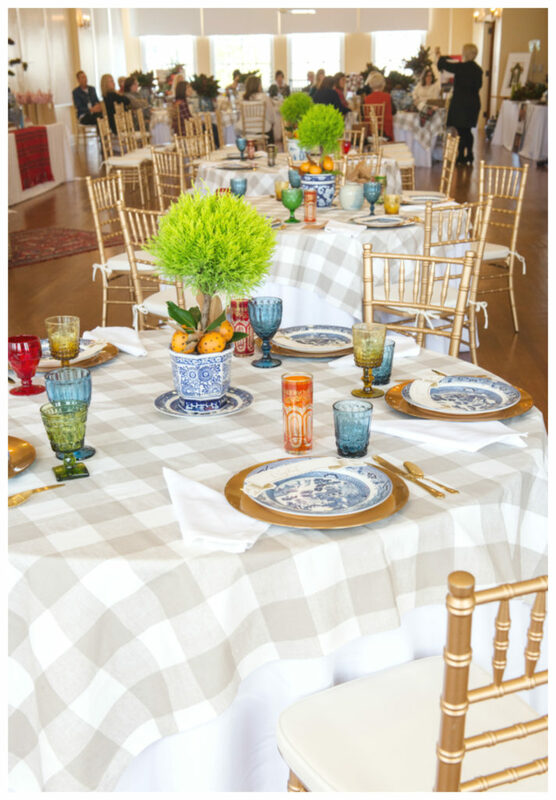 They have these wonderful chairs on site for events so all I had to do was add some buffalo check and blue and white! The ballroom looked so pretty! 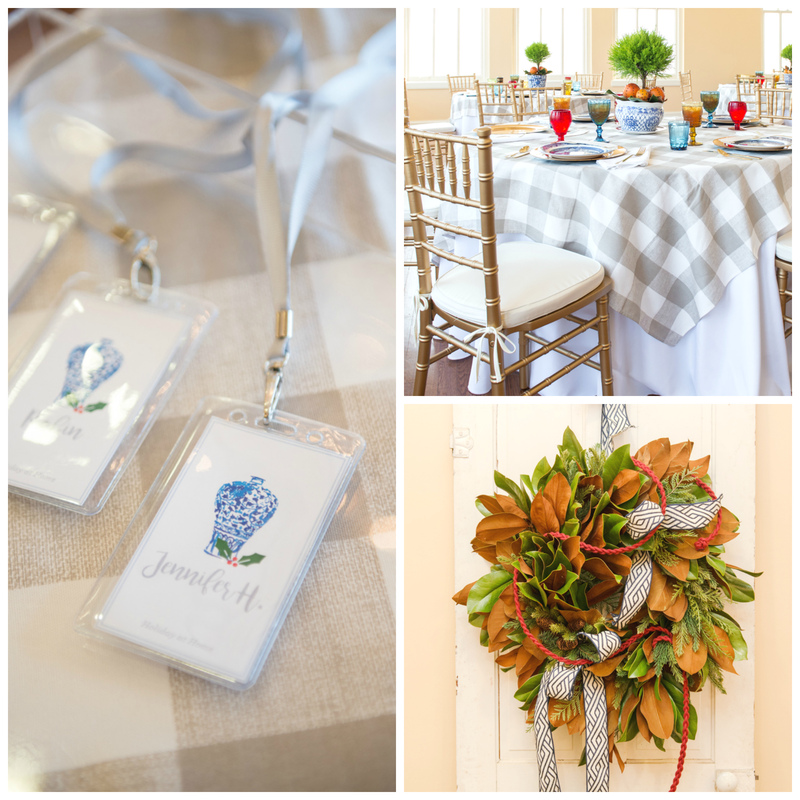 Blue and white, twinkle lights, fresh magnolia,jewel tones and the best pimento cheese and pie from Royers Cafe. A good combo for a good day indeed! So many people worked together to make the event shine, especially this handsome fella who harvested beautiful magnolia from NW Arkansas and drove it all the way to Texas for us to gush over and admire. Keith Taylor you are an amazing talent, force and good person! You make me laugh so hard, you call me on my BS, self doubt, you make me think and dig deep and you talk just like I do. We were meant to be buddies and collaborate! But y’all this is a lot of work and a lot of miles and he came to our little town just for this event! And he is a hard working machine! I mean who does that..who drives that far to help a friend with a class???! So grateful! While we like to think all things are bigger and better in Texas, the fresh magnolia that Keith “imported” to Texas was truly some fine and lush magnolia. It was so pretty many of us thought it was artificial. It is simply a different species and climate than we have down here and it was joy to see him create with such lovely natural materials. He also shared his wiring and construction secrets, ribbon philosophies and other tricks and tips including freedom to NOT be afraid of the ribbon aisle at the Hobby Lobby. 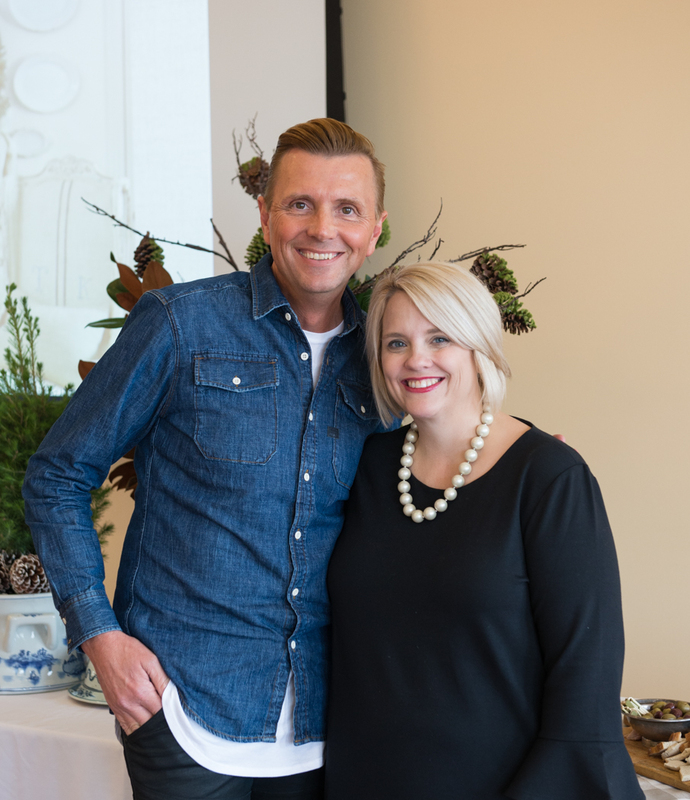 And of course he is so fun to listen to and learn from and he truly gets the core heart behind creating beauty and home. 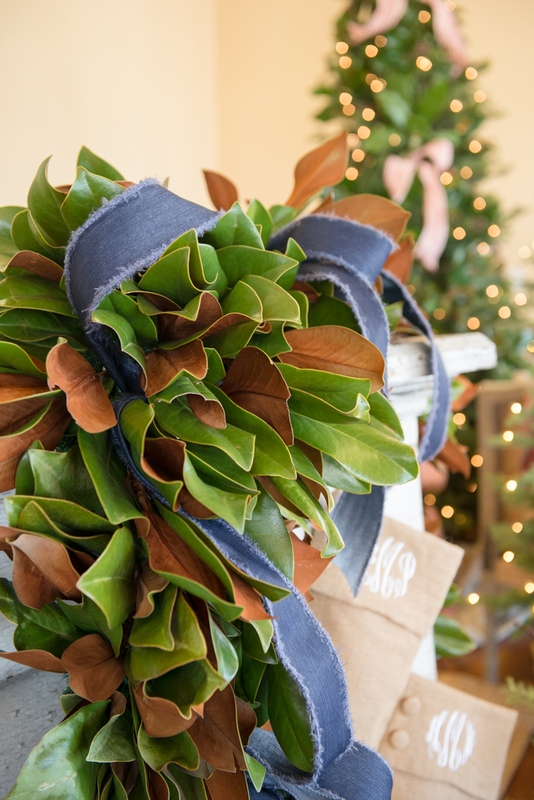 Keith showed us step by step how he takes a basic, inexpensive faux garland or wreath and then uses that as a base to add fresh magnolia! 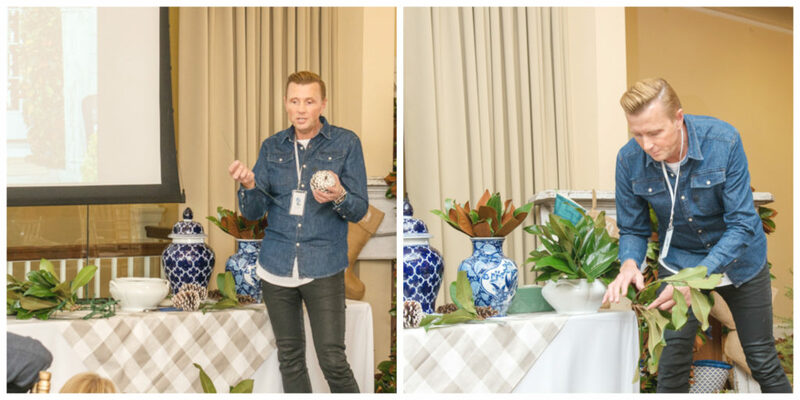 He also showed us how to use magnolia leaves for simple arrangements in different vessels and talked about his experience doing “magnolia magic” for Southern Living magazine in freezing temps! And he says the wedding aisle is the place to go for the best ribbon NOT the holiday ribbon section. 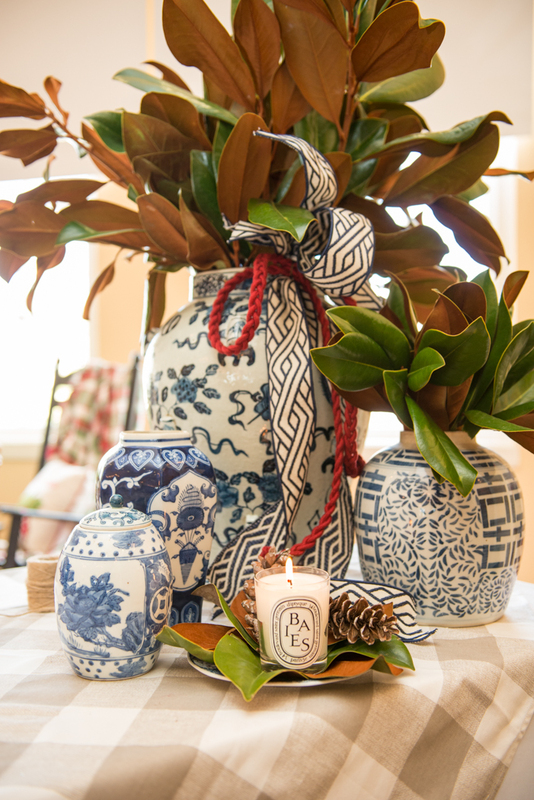 The wedding supply area is where he found much of the ribbon we worked with including this navy ribbon above the red cording and navy and white ribbon shown below and on the ginger jar in top photo. Keith showing us how to pinch and wire the ribbon and snip…we talked about shoestring bows and 1-2 loop bows and no bows, just flowy ribbon wired to the tree at different points. 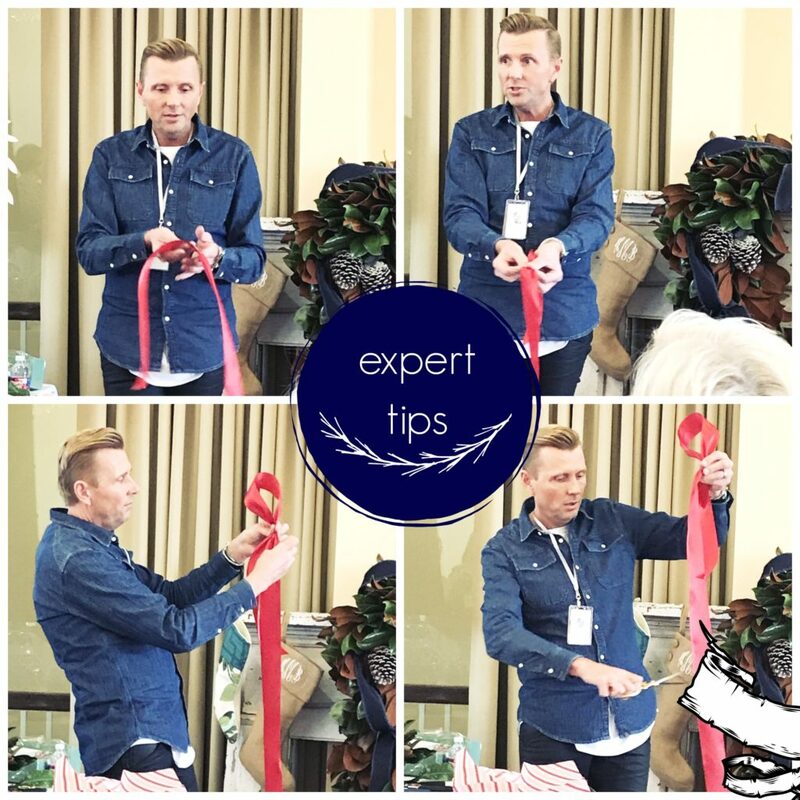 I think many of us felt like he gave us some “ribbon freedom” with how to use and decorate with ribbon and leave behind the “Texas huge bow” legacy many of us feel bound to at the holidays. I mean big bows are fine, but he def showed us more and some fresh ideas that we all savored. At one point he was talking and there were women on the floor sitting cross legged to get closer and see and others videoing with their phones. We know magic when we see it!! 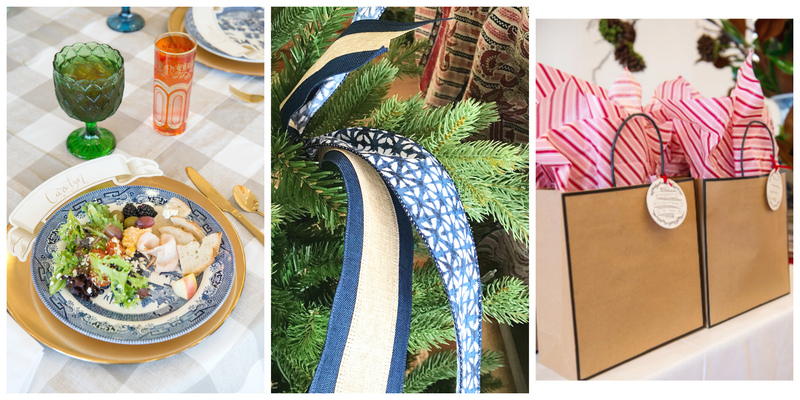 The indigo looking ribbon in the middle photo is from Michaels! It looks so John Robshaw to me! Yes indeed, the beautiful ballroom in the Barnhill Center above the historic Simon Theatre was the perfect setting for this day. Such beautiful light in this huge space! Kristen Leigh Calligraphy did the envelopes and placecards on papers from Hermann’s and they turned out so pretty! 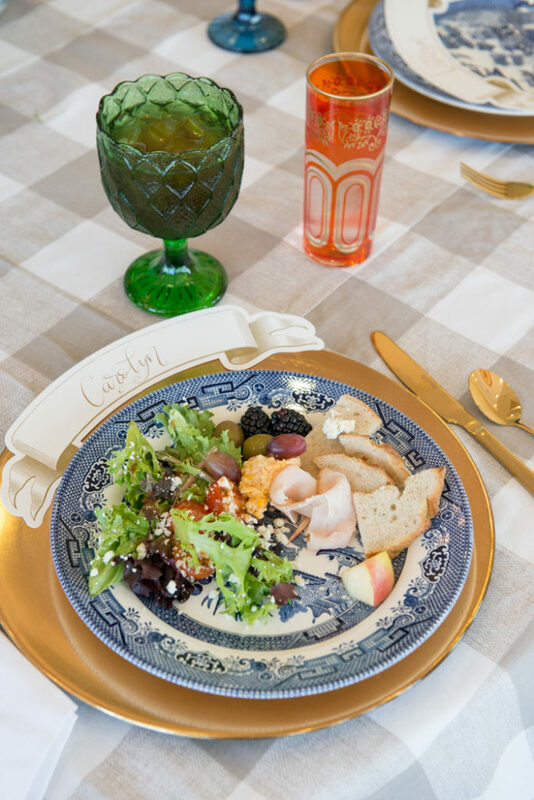 The tables were decorated with blue and white plates, brass chargers, unique brass flatware; and a mix of pressed glass stemware and glasses both vintage and new, some from World Market! And of course buffalo check! Lemon cypress trees (from Lowe’s!) and artificial cloved oranges from Hermann’s showed a mix of real and artificial decorations as well as high and low. 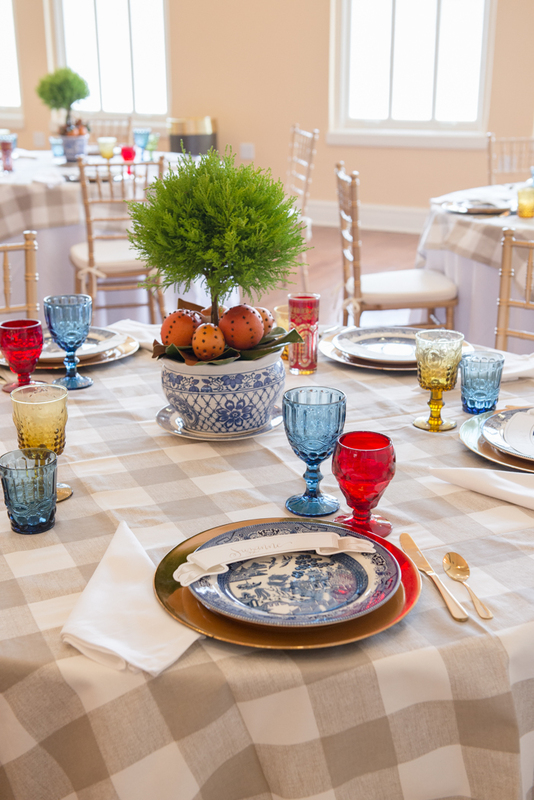 The “class” tables were decorated with high and low mix of blue and white jars from Hermann’s, antiques shops and my collection, even Amazon and TJ Maxx! 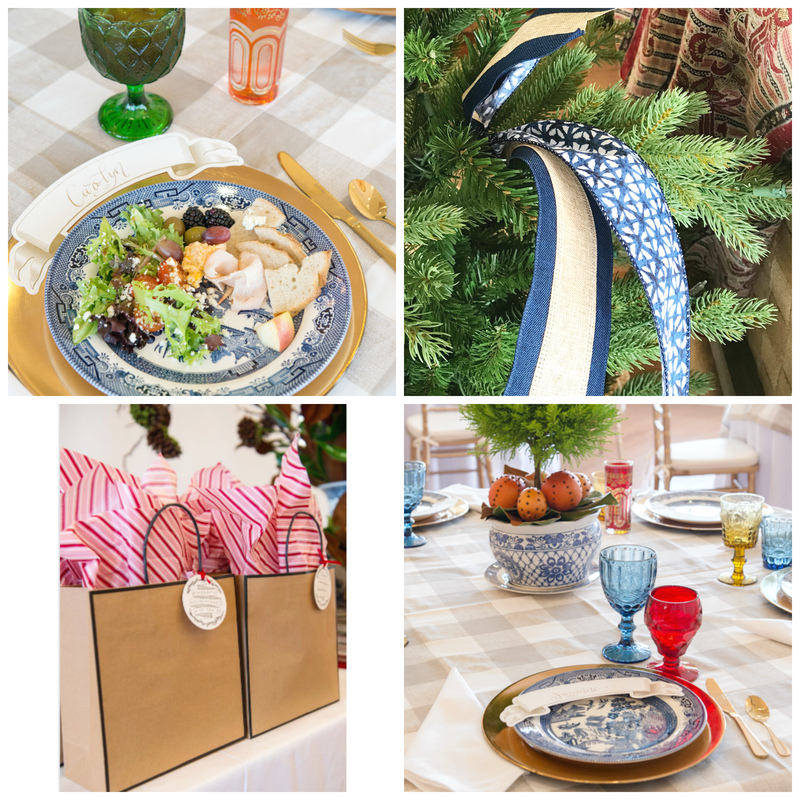 It was truly a mish mash of favorite things for the holidays: buffalo check, pops of red with blue and white and fruit, jewel tones and fresh and faux greenery alike. 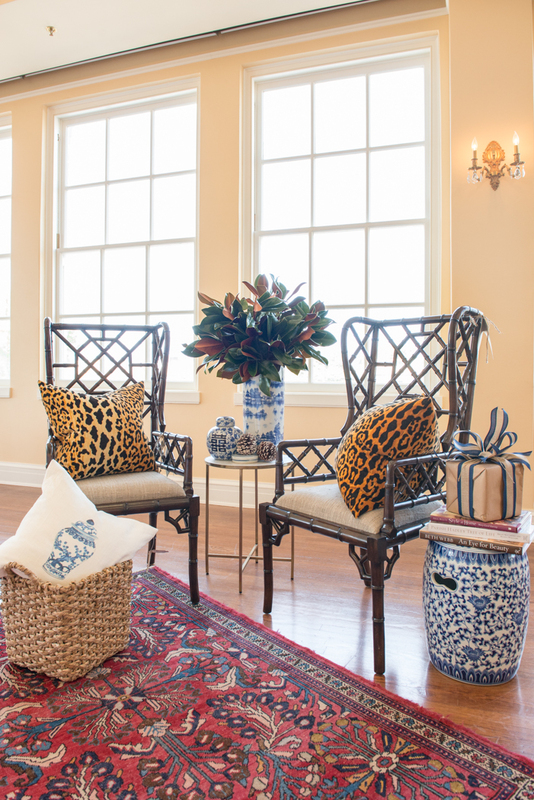 We also had several vignettes in the room including these chinoiserie wing chairs from Hermann Furniture, they have so much bamboo look pieces right now which I love! I pulled in the vintage rug for a pop of red and hygge warmth, and Keith’s magnolia and perfect bow on the Kraft package along with pillows completed this area! Keith, Jennifer Hermann and I agree, Kraft wrapping paper rules! You can see below how we had the east side of the room set up for class space and the west side for our lunch…it was so nice to have so much space to enjoy! 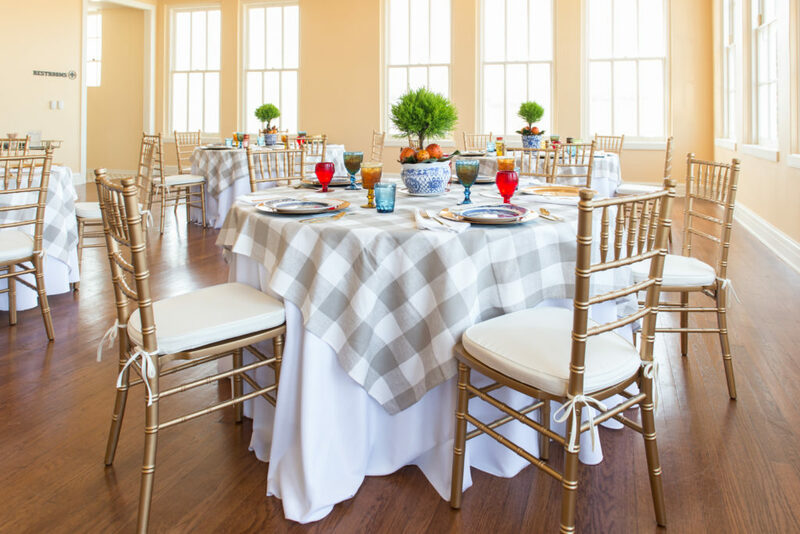 Good light, tons of windows, wood floors and chandeliers…just a dream setting for an event like this! 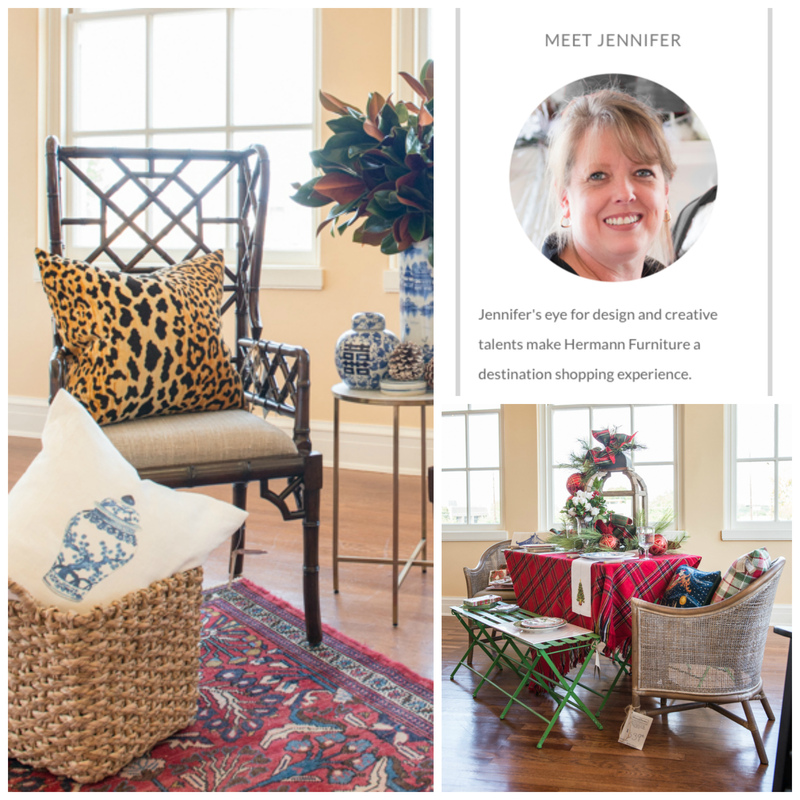 After lunch Jennifer Hermann spoke to us more about ‘trends and traditions’ and some of her favorite things from Market this year, she also shared about mixing paper products with real china for the holidays. Hermanns has some of the cutest paper goods, wood cutlery and napkins both cloth and paper. She also talked about doing extra holiday seating on the back porch or patio, something we can easily do in our climate! Love that and she brought my favorite green picnic table they stock to show that idea! After the close of the class we all walked over to the store and saw just how much they have in stock and the variety! I really love that were able to use faux pine cone stems and trees from Jennifer and mix with the real magnolia from Keith to show that there really are no rules when it comes to real versus artificial and mixing it all together. I enjoyed working with them both so much! I have been a fan of Hermann’s for years so it was a joy to collaborate! 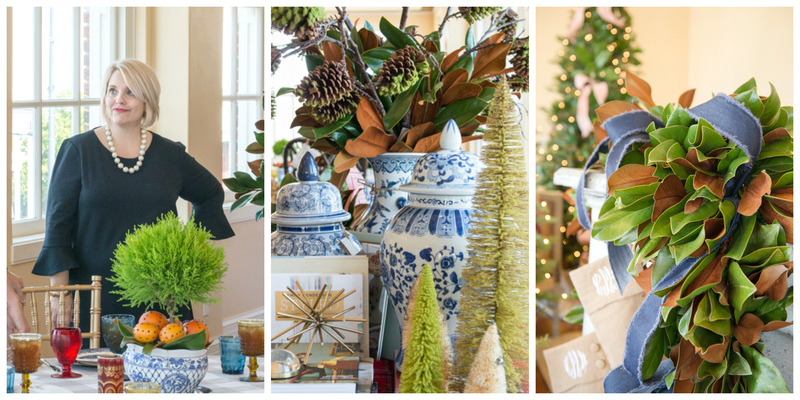 I could go on and on about this event, it truly was a combo of my favorite things: a good Nancy Meyer film, a historic venue, small town charm, talking about the heart of the home and holidays, fun people, talented friends and business owners, all mixed in with blue and white ginger jars, yummy pimento cheese, pie and ribbon! Thank you Downtown Brenham for working with me to host this event along with Keith Taylor and Hermann Furniture. I think we all had a great time! 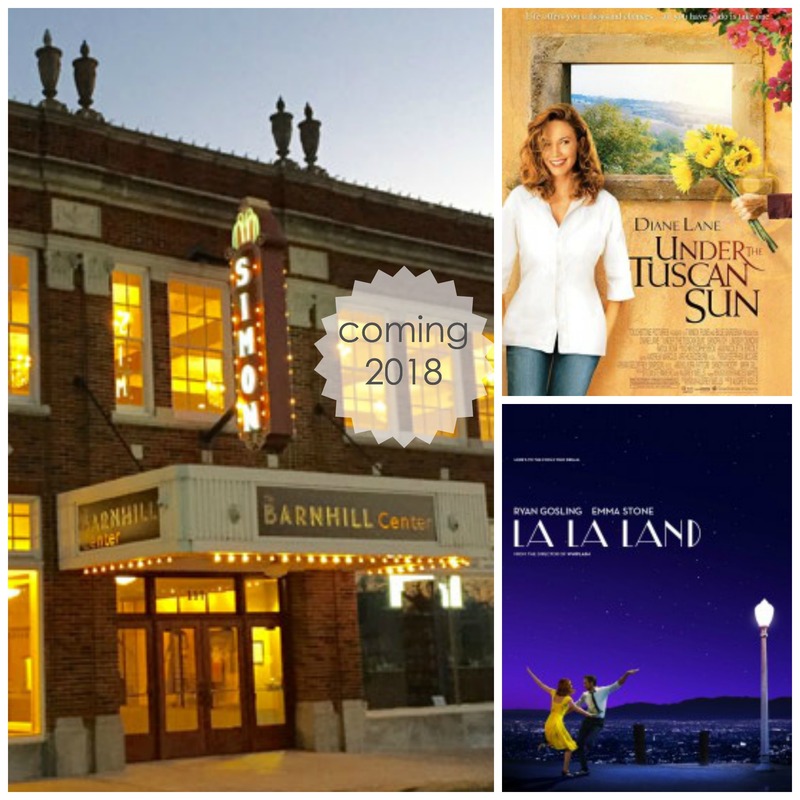 And they have some really great movies and fun planned in 2018 at the Barnhill Center’s ballroom and Simon Theatre, including an upcoming wedding show, and some awesome movies perfect for girls night out or a good date night. Seeing a favorite film in this restored theatre really is special and was one of my favorite parts of the entire weekend! Check here for dates and show times. 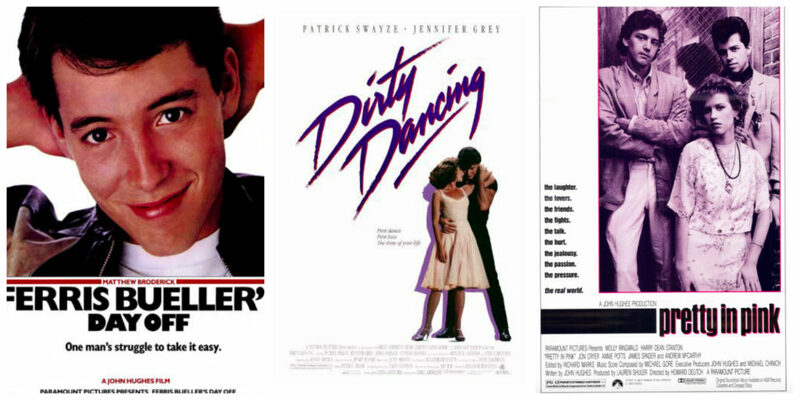 And later in the spring look what is coming up at the Simon Theatre…oh yes..PATRICK SWAYZE! He is even better than Jude Law AND blue and white ginger jars combined!